Don't miss out. There's only 3 available and 3 other people have this in their cart right now. Don't miss out. There's only 1 available, and 3 other people have this in their cart right now. 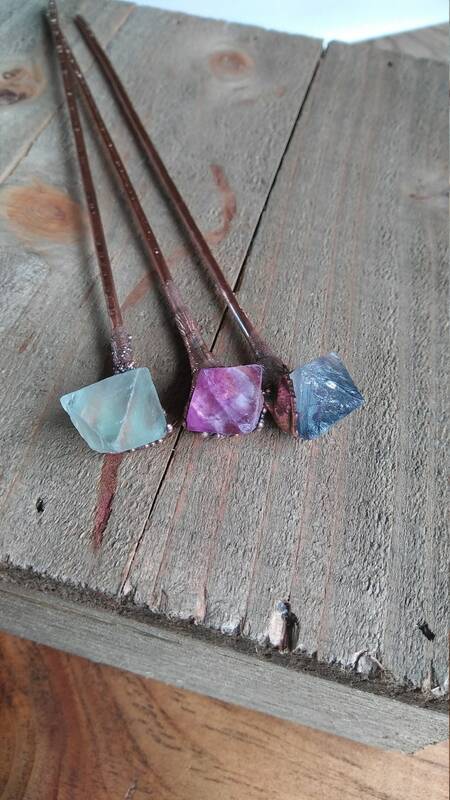 This listing features three Fluorite Hair Pins made by copper electroforming. It takes approx. 48 hours to make one of these beautiful and unique hair pins, The stones are attached in a way that will last many years and the stone should not fall out. 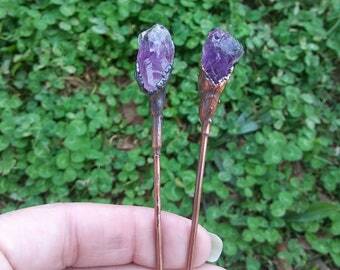 The copper around each gemstone was oxidized and polished, I also sealed the copper so the patina can last longer. Each Pin measures approx. 5 1/2 inches long including the tip of the stone. Blue Fluorite stone measures 13x10mm approx. Green Fluorite stone measures 13x10mm approx. Purple Fluorite Stone measures 12x12mm approx. It takes over 48 hours to make these unique hair sticks. Each Hair stick was aged, polished and sealed. These Hair sticks can be used daily or for any occasion. Each Hair Stick will be shipped in their individual Handmade Boxes ready for Gifting.